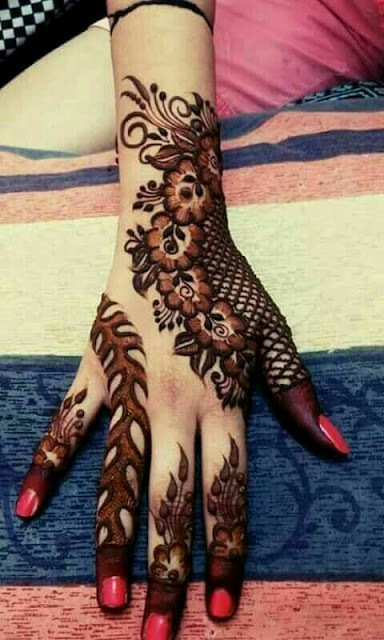 Arabic mehndi designs are becoming very popular with women all over the world because unlike many other designs arabic mehndi designs have a elegant minimal touch to it. Most girls prefer arabic mehndi designs which is a contemporary breathable spin to the age old henna art tradition. 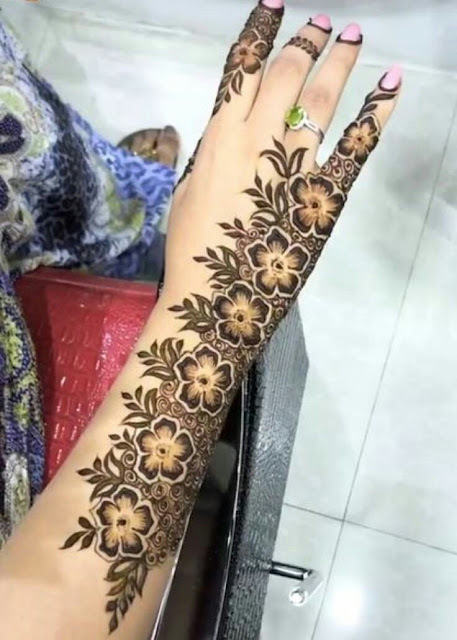 Arabic mehndi designs were limited to parties and festive occasion like eid early but a recent trend has sprung up and you can spot even brides opting for these designs. 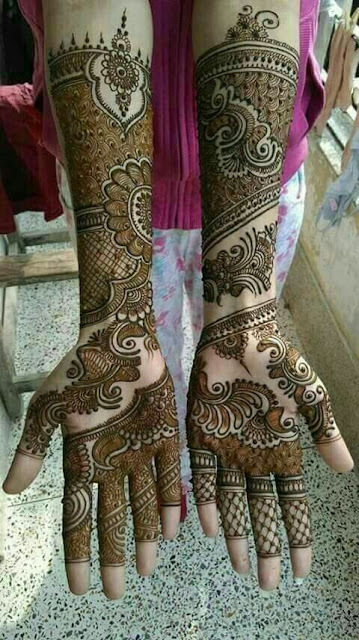 Wedding is a special occasion for every girl and for this kind of important event women choose more detailed arabic mehndi designs which cover the entire length of hand giving an attractive ethereal look. 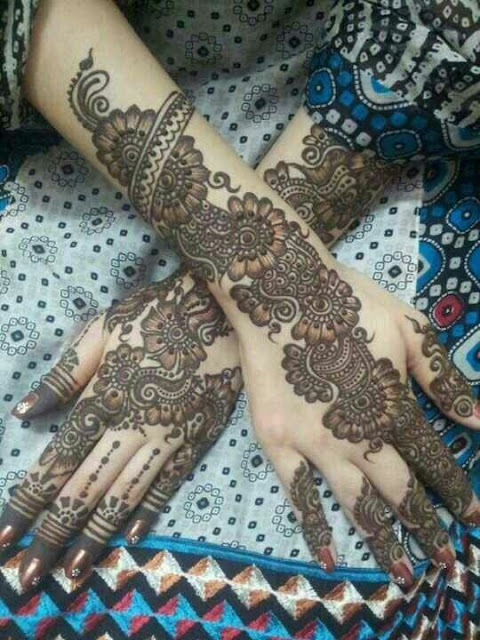 Infact majority of brides these days are opting for Arabic style of mehndi with some addition of traditional motifs. Here in this post I bring to you some of the most breathtaking arabic mehndi designs for full hands. 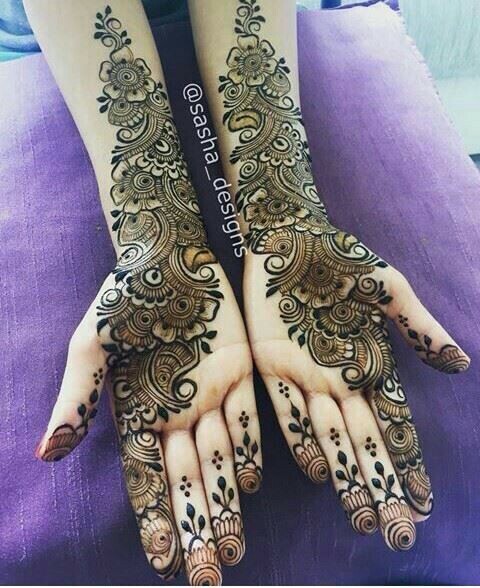 Since all the designs in this post are for full hands even brides can take inspiration from these designs to select a unique bridal mehndi design for your important day. Not just for weddings but these arabic mehndi designs for full hands can be tried by women for festivals and auspicious occasions too. 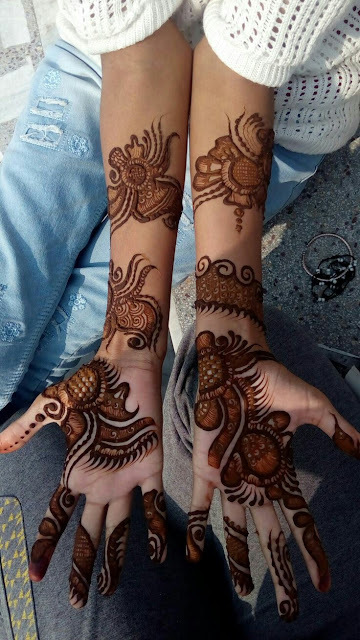 These mehndi designs are on heavier side and aren't very beginner friendly but with a little practice you can master the beautiful art of henna tattoo. 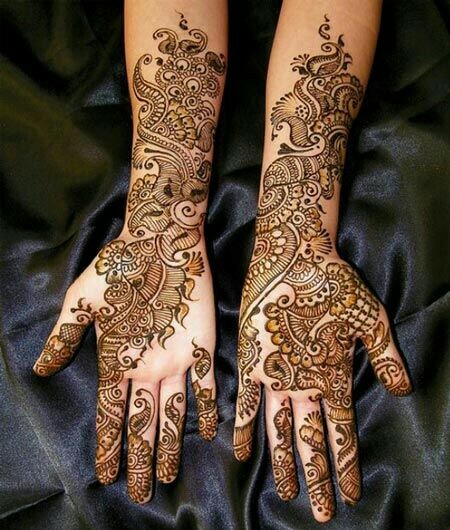 In southeast Asia henna mehndi plays an important part at weddings and festive occasions. Infact lavish mehndi ceremonies are organised these a day before the wedding where the bride is decorated with intricate mehndi designs on hands, arms and feet. Apart from weddings other traditional events like diwali, karvachaut also are occasions where elaborate henna patterns are applied by women. 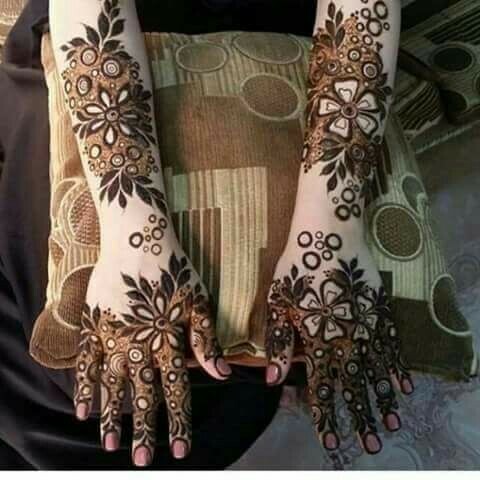 Islamic culture also has a special place for henna and before eid women apply mehndi designs and welcome happiness and joy. For all these important occasions women want the best and lavish mehndi designs which cover entire length of hands. Below are some of the latest arabic mehndi designs for full hands which you can try at weddings and festivals this year. 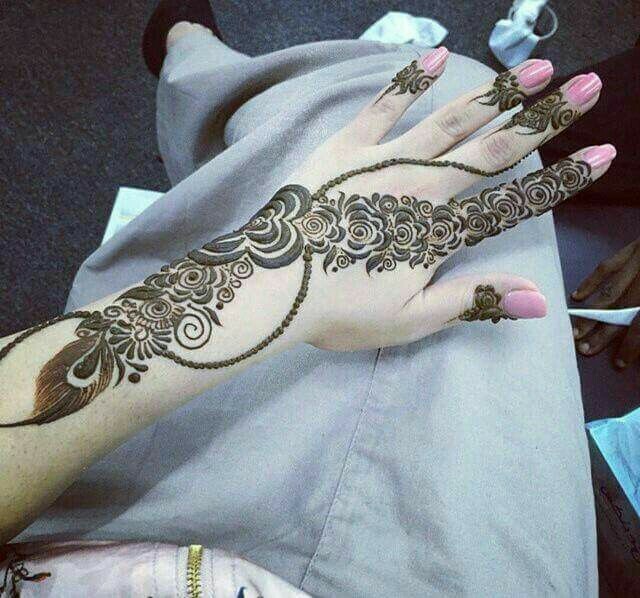 Arabic mehndi designs are preferred by young brides of today as they give a very elegant and beautiful look. 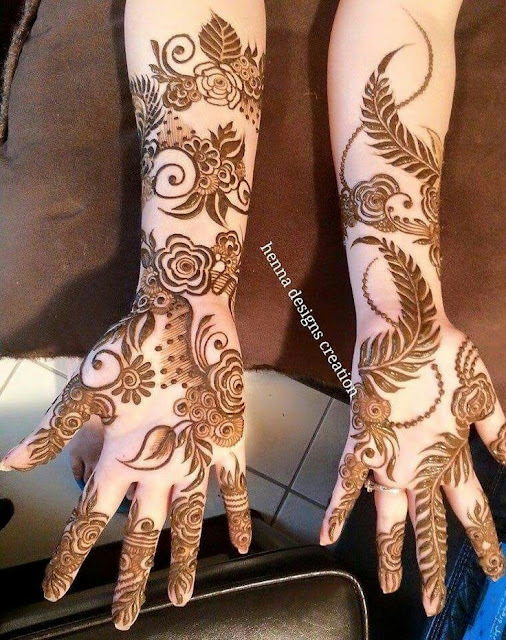 If you are looking for latest henna designs then this thick shaded arabic mehndi design for full hands is a nice pick especially for back of hands. Ethereal and contemporary this arabic mehndi design is perfect for festive occasions and parties. 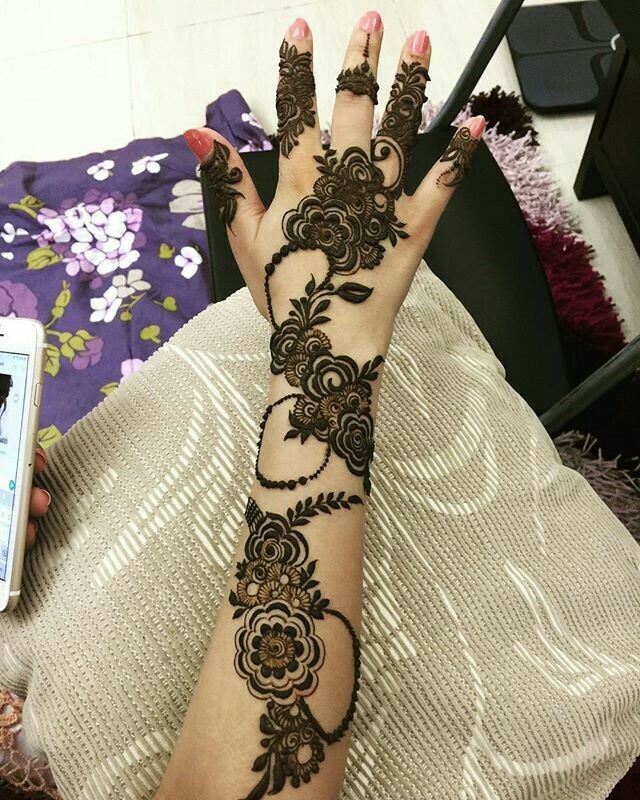 Floral arabic mehndi designs are a huge hit with girls but even floral are getting very innovative these days. Try this circular patterned arabic mehndi designs for full hands which uses thick strokes and dotted patterns leaving lot of empty spaces for a unique henna tattoo look. Arabic mehndi designs for full hands can come across looking very heavy and complex but if you try a single line mehndi design you can make even full hand henna look breathable and minimal. This single line arabic henna experiments with lots of swirls and paisleys for an attractive majestic henna art. 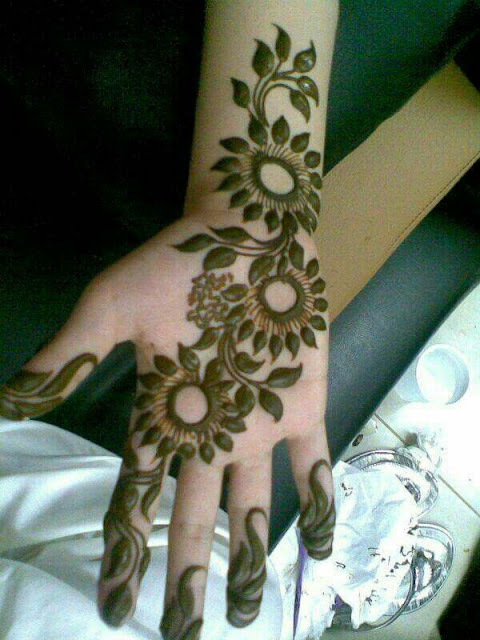 If you are looking to apply henna yet downplay it at certain occasions then this design is a perfect choice. This design is also a great pick for friends of bride. Even sister of brides or groom can give this design a try to nicely complement your indo western ethnic outfits. 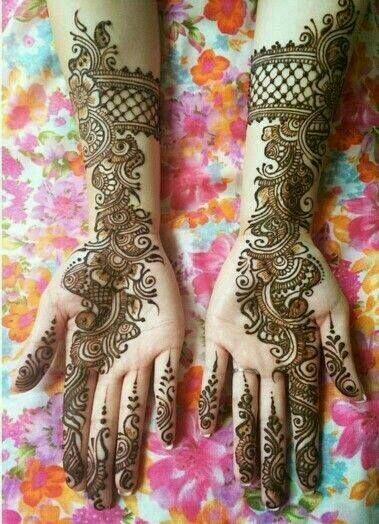 For occasions like your engagement of valentines day you dont need to go all traditonal with your henna designs . Try a more modern hearts pattern henna which is all romantic and chic. 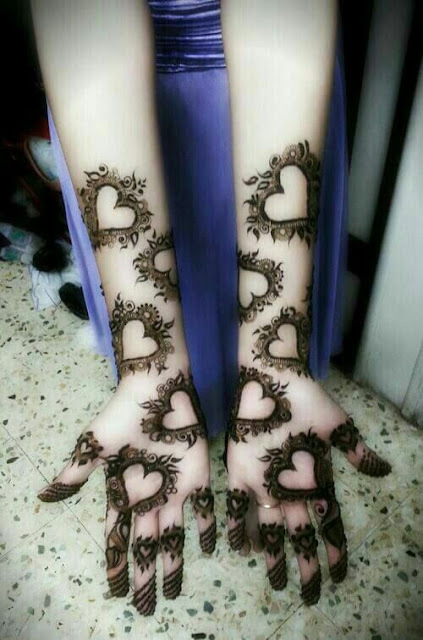 These kind of intricate arabic mehndi designs for full hands with lots of hearts on hands can also be applied for your marriage anniversary parties or festive occasions like karvachaut. Looking for beginner friendly thick arabic mehndi designs for full hands? Then your answer is right here in this floral henna tattoo. This nature inspired mehndi design uses thick strokes to bring together leaves and flowers in a beautiful aptivating pattern. You need to cut your henna cone in a thicker hole for a design like this and maybe use a different thinly cut cone for thin stroke detailing. Women prefer arabic designs becuse it doesnt cover as much skin as the indian mehndi designs do, giving it a more youthful modern appeal. This bold and beautiful mehndi pattern works in layers to give a unique look. 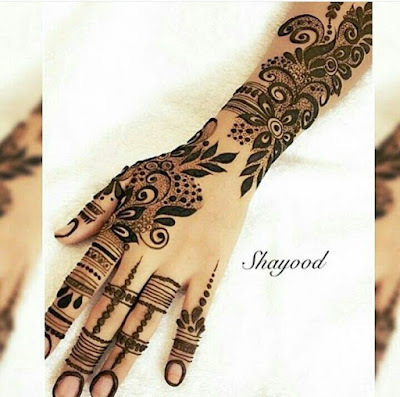 Arabic mehndi mehndi designs for full hands with lots of open spaces are in trend and this layered intricate pattern is stunner suitable for both weddings and festive occasions. Even brides can give this design a try. Simple arabic mehndi design which still stands out grabbing all attention all thanks to its unique circular patterned flowers. This mehndi design is a nice pick for bridesmaids and for simpler traditional occasions. Attention all you brides of 2018, deck you hands in this gorgeous floral bridal arabic mehndi design which is delicate yet glam for an uber chic look. The layered pattern with lots of spaces is the specialty of this design and you can actually personalize this design by adding your wedding hashtag the empty space. For wedding ceremonies and traditonal function try this classic arabic style henna with veins, flowers, swirls and dots which rest on a checked style hand band on your wrist. The bold and rebellious women out there try something hatke this wedding season. This arabic mehndi design for full hands featuring a series of concentric circles is sure to grab instant attention at any event. The mesh detail on fingers also looks glam and unique. Jaali aka mesh detailing in the art of henna isnt a new concept but this marvelous shaded design makes mesh its centre of attraction and plays with flowers around it. 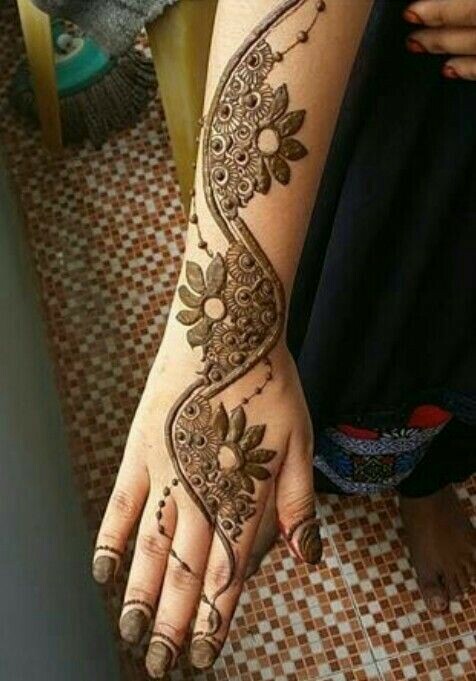 The whole concept of shaded leaf on a single finger also adds to the charm of this unique arabic mehndi design. An effortless fusion of indian and arabic mehndi designs This bridal henna pattern has the right amount of mehndi strokes with some breathing space to give it a modern look. If you are an indian bride then this henna design is perfect for your big day reflecting a fusion of two different cultures. Another thick floral arabic mehndi design for full hands which look simply splendid. I love how dotted circle patterns are used to bring this whole design together in a fascinating blend of modernity and tradition. This is classic style arabic mehndi design for full hands which uses flowers and paisely patterns with an array of swirls and vines to give a pretty bridal look. New brides can flaunt this mehndi design at parties or festivals like eid or diwali. 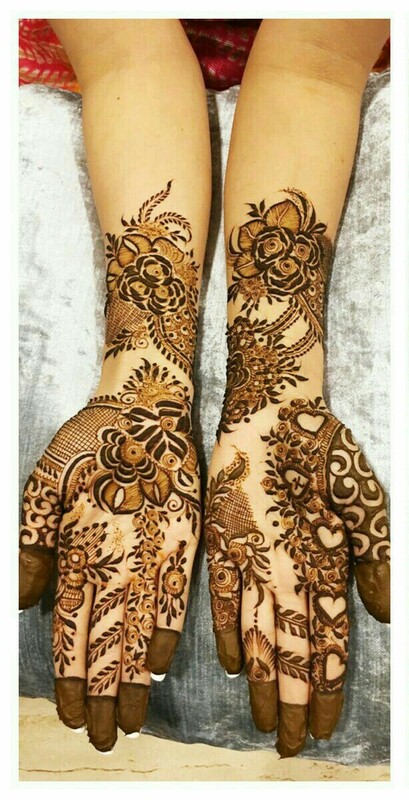 Arabic mehndi designs for full hands with geometric patterns? You heard it right! This striking flowerless mehndi design is for the bold and beautiful you. Nothing short of a show stealer this morrocan inspired arabic design dabbles in checks, swirls and leaves for a unique look. The art of mehndi application on hands and feet is said to be more than 5000 years old having its origin in India. This age old art has a lot modernization and has spread many other cultures where women apply mehndi before any special occasion, be it traditional or non traditional. With time modern offbeat motifs have made way into mehndi patterns and one such motif is the rose pattern. This single line rose arabic mehndi design is a gorgeous pick for a graceful look at any festive occasion. a vivid chain of leafy patterns form the crux of this striking mehndi design with scattered floral and sparse mesh detailing. The rose detailing on fingers make for a beautiful look. Florals in henna mehndi design is a well known pattern but this latest side flowers train arabic mehndi design is nothing less than fabulous. This decorative art like floral design isnt very beginner friendly but with some practice you can actually master it for a trendy unconventional look. If flowers are what you love in your mehndi design then try this thick floral shaded arabic mehndi design. 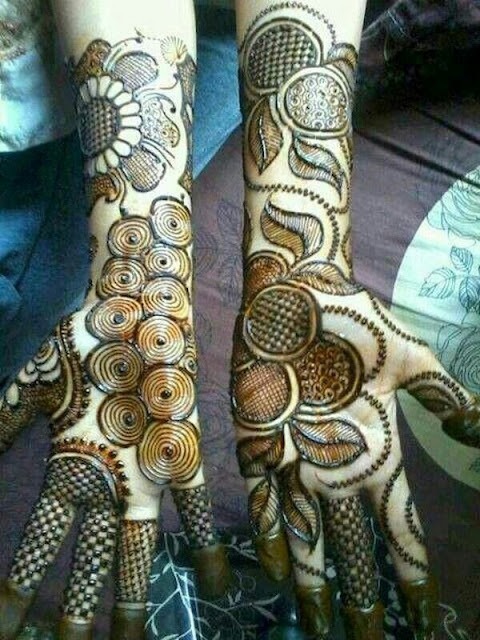 This particular design is very interesting take on henna art using space intelligently leaving lots of bare space to highlight the floral motifs, circles and leafy pattern. Giving a tattoo like impression this arabic mehndi design with floral patterns and intricate mesh detailing is captivating. 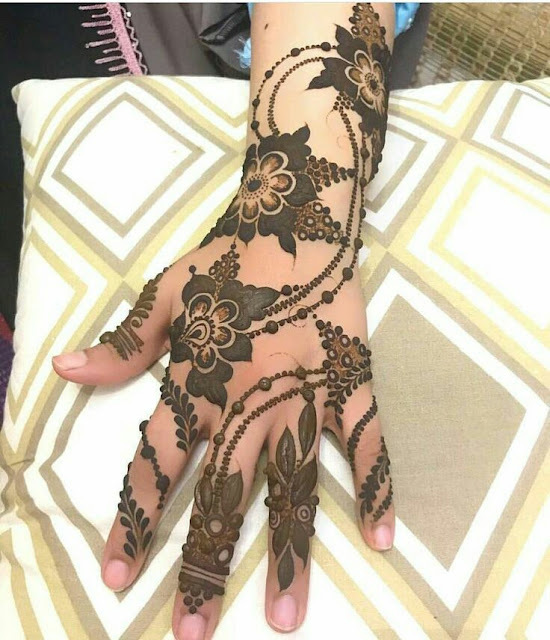 I particularly love the hidden heart details on thubs in this henna design making it a good choice for young women for all kinds of parties. Even modern brides can give this design a try. Bored of the same 'ol mehndi designs? 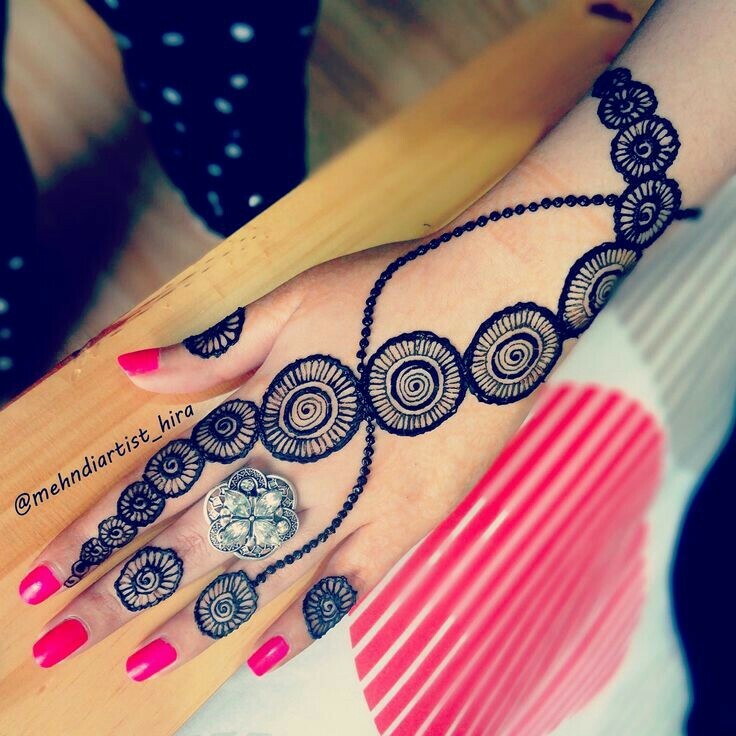 Then give this gorgeous arabic mehndi design with swirl concept a try. 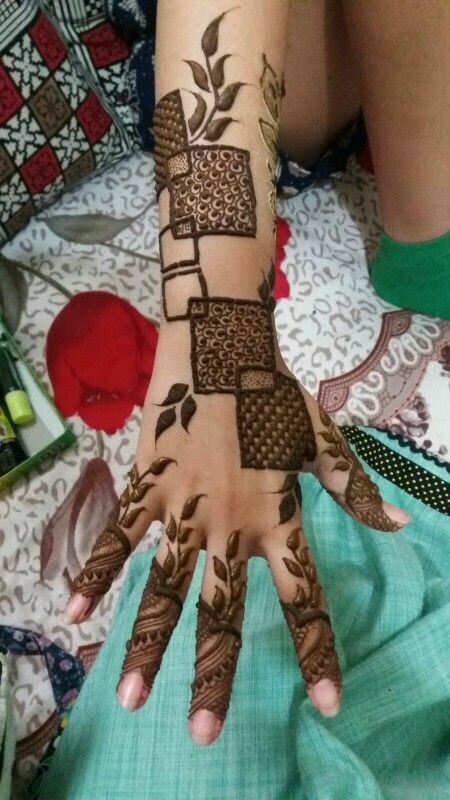 You can use this latest trending mehndi design for all special ocasion on both front and back of hands. Which of these arabic mehndi designs for full hands do you like most?